Angry Birds Dream Blast is a physics-based puzzle game where popping 4 bubbles of the same colour that are touching each other results in a better Angry Bird! Tapping on birds causes them to blast! The chain reaction mechanic when birds explode feels delightful. Even though the game feel is really juicy, the monetization design and the system design of the game really need a lot more work. The User Experience for everything outside the actual puzzles, from the menu to the store feels neglected and half-baked. Basic features like playing without an internet connection and notifications aren’t implemented. Rovio is one of the biggest names in the game industry. Their smash-hit game Angry Birds was a cultural phenomenon which took over the world in 2010. Since then, the company has been trying to leverage its Angry Birds brand in order to make another smash hit. There have been 17 Angry Birds games since 2009, Each game take the Angry Birds IP and tries to use a mechanic that works on mobile. No game from Rovio has been as successful as the first Angry Birds game, but it is still a company filled with extremely skilled game makers who know how to make a delightful mobile game. Day 7 retention is an important metric in F2P games. If you have good retention, that means players are coming back to your game. An engaged player is likely to pay some money to continue enjoying the experience. In a D7 deconstruct, I play a game for 8 days after I install it and then see what made me want to play the game each day. An article on pocketgamer.biz about Rovio soft launch Angry Birds Dream Blast in the UK on iOS and Android. Shifting countries has finally paid off! The article also refers to the previous game called Angry Birds Blast, which I haven’t played. I played the game on my Motorola G4+ Android phone. On October 9th, 2018, the game has 4.0 stars, 1k installs and the trailer looks like it has really low framerate. Makes the game looks stuttery. This was a major negative for me. Uploaded by Angry Birds on 2018-10-12. Recorded playing the first 2 levels of the game for the first time. I also went through the IAP options. The app size was small (59 MB) and the app icon was also very cute. The moment you open it, a big pop-up asking to agree to the Terms and Conditions. Then something very odd happens. The game starts off without a tutorial! It took me a moment to realise that I needed to tap on specific coloured bubbles in order to finish that level. 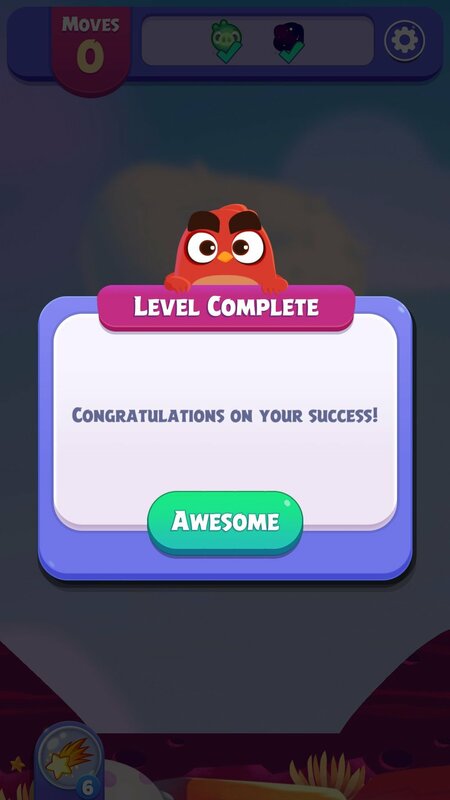 Bold choice soft launching a game without any tutorial, Rovio. But, I think they might have fixed it with the latest update. The first things I noticed were the ‘Moves left’ counter and the excellent sound design of the game. Each bubble feels like it is interacting with the other. The bubbles themselves act and feel delightful. Since there was no FTUX, I wasn’t sure sure how the birds are formed. What is the bubble threshold after which a red bird is created? The birds merging mechanic was also something I figured out by myself without the game explaining it to me. After the first level, you are taken to the main screen. Here, some object that you gathered from the level feeds into the progress bar prominently displayed. It is never clearly communicated what exactly that is. There’s also an energy system with 5 lives as the max count. Not a huge fan of energy systems as they artificially restrict players from consuming content. But I think with F2P puzzle games, other monetization systems haven’t been successful. The design of the main menu is rather strange, It is just one screen and there’s no saga-style map to show you how many levels the game has. There are only 11 dots that represent 11 levels shown at a time. Also, there’s a static image of the 3 Angry Birds sleeping on the main menu for some reason? The main menu needs work. 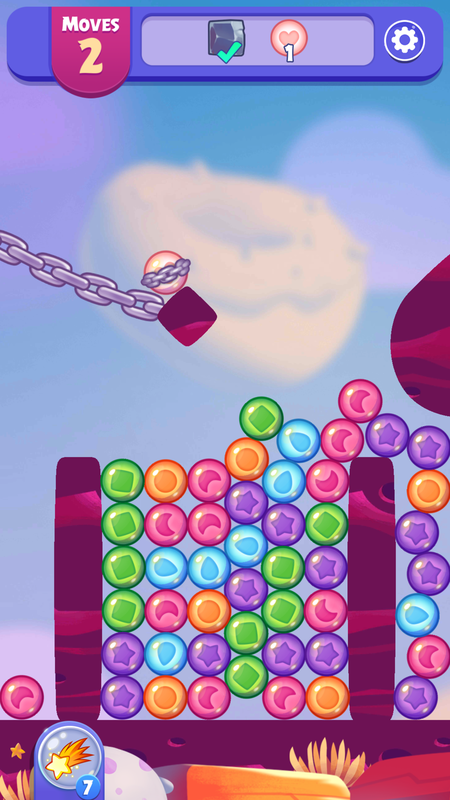 The primary mechanic of the game is that when you pop a chain of bubbles of a similar colour, it creates a Red Angry Bird. The bigger the chain, the bigger the Red Angry Bird. 2 Red Angry Birds near each other combine into 1 Yellow Angry Bird. 2 Yellow Angry Birds near each other combine into 1 Round Bomb Angry Bird. You cannot combine 2 Round Bomb Angry Birds. I tried. The best part of the game is when you discover that you can trigger chain reactions if you create enough birds on the level and explode one of them. If the blast effect touches another bird, then it triggers that bird too. Since you don’t use moves when a chain reaction happens, you can effectively finish a level if you get enough birds in a screen. Some of the most interesting levels have objects which play with the 2D Physics system. For example, Level 10 has a circulating object which keeps changing the ball arrangement at the top of the bubble pile. Very interesting! The balloon popping feels really delightful. Though I wish the the piggy balloons looked a bit scared when they are about to burst, just like how expressive the Angry Birds are. There doesn't seem to be a scoring system even though everything in the game feels like there should be one. The way the XP system works is also very cryptic. I don’t know how I get feathers to go into the XP bar. Every 10 levels you finish gives you a reward chest with a paltry amount of coins and sometimes a Star Powerup. The rewards don’t feel that rewarding. You get 10-20 coins for finishing 10 levels and need to spend 100 coins in order to get 5 more moves. Finished 20 levels. Interesting approach to Toy Blast mechanic. The sound design is excellent. The level design does some interesting things too with the bubbles concept. Getting the chain reaction at the right time feels amazing. The game doesn't have a notification system on Android, so I started the app without being prompted. The game also got updated today (10th October, 2018). Can’t see any noticeable differences with the new update. By the end of the Day, I finished 10 levels. Though the game is interesting to play, the meta of the game is very weak. I’m not sure what is the primary question the game team wants the soft launch metrics to answer? Do they only want to see how many levels people are completing per day? Even though there’s no notification system, I still launched the game because I liked the bubble popping mechanic and wanted to see what the next levels were. On Day 2, I finished 10 levels. The difficulty of each level seems to be getting higher and higher. Still disappointed by how stingy the game is with rewards you get for finishing a significant chunk of levels. For finishing XP level 5, I got a few coins and 1 Star Power up. For completing level 40, I got a chest with 30 coins. I honestly thought this might be the last day I'll play. The only reason to continue playing is to see how many levels are there left. The game has no hint system, like how most other match 3 puzzle games have. Because of the physics nature of the game, the level design sometimes caused issues with completing the level. The level pause screen doesn't tell me which level I'm on. The biggest version of the red bird's bubble popping sounds like a death scream, which really sounds disturbing. Level 46 was the first time I used the star power up for something useful. Had a stack of black cubes left with 1 turn left. So, shot a star power up into the center. It took me 50 minutes of playing the game to finally finish all 6 lives. Didn’t play it too much on D4, but my wife saw me play the game and understood the game’s mechanics quite quickly. Level 56 has a very hard challenge. I think I used 8 lives to finish that level. The Pig Balloons work in a weird, fractal way. The game doesn’t communicate how many blasts will it take for a big pig balloon to completely disappear from the level. Level 65 is another blocker. I am now just playing the game to see how many more levels there are ahead. I played the game for 50 minutes till I finished all my 6 lives. Yesterday night, I dreamed of the the game too. How to optimise my bubble popping and getting the most out of chain reactions. I've watched many ads to get 3 more moves in the game across sessions. I don't think the game is set up to monetize from ads though. Also, usually watching an ad doesn't guarantee you a positive outcome. So, as a player you might as well not use it. After finishing level 72, I got a survey in game asking me to answer few questions. Seems like surfacing surveys so late in the game might be a bad idea. A new blocker has been introduced at Level 75. First time I've seen the transparent Shield blocker where you can't tap and bust bubbles. Only bombs work. Or connecting a bubble above the shield to a chain below. Level 76 is when I noticed my first bug! An explosion caused one of the bubbles to clip through a rock texture and rest inside it. Finally beat it by the widest margin I remember in this game - 18 turns left. There are zero retention features in the game. Releasing a game without a notification system on mobile into soft launch will just tank all your metrics. There are no social features. A saga style map works because it is easy to show social progress on it. The balancing and pacing of the rewards doesn’t feel rewarding. The game needs a variety of power-ups. Offline play should be implemented soon. 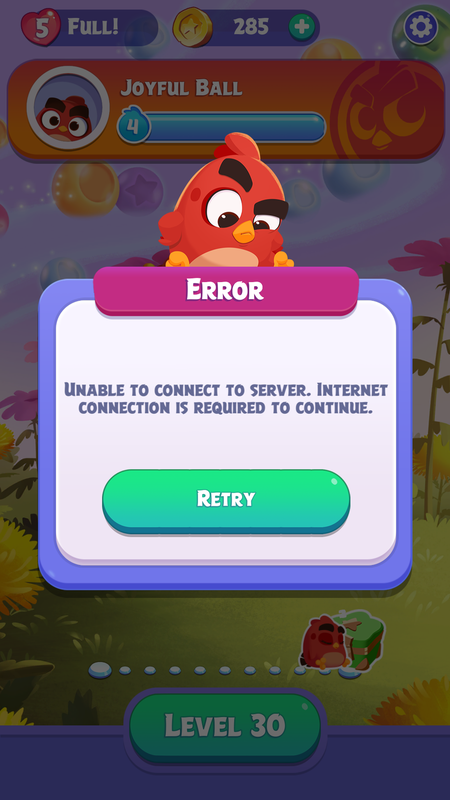 Mobile puzzle games are sometimes played when players don’t have steady internet connections. There should be a hint system when players are stuck. This has now become a quality of life feature in mobile puzzle games. Needs a ‘Rate the Game’ flow which surfaces after the first few levels. I think the primary way the difficulty is controlled in the game is though the number of bubbles of each colour released with each turn. In most levels, I remember winning by a wide margin or losing by a wide margin. It rarely felt like I just about finished a level on the last move. Angry Birds are known for their delightful little narrative animations and snippets. This puzzle game will greatly benefit from having a story element in between the levels. Now, instead of just seeing what the next challenging puzzle of the game is going to be, they will also be motivated by where the story will go next. Gardenscapes and Homescapes have perfected this meta which combines puzzles and story-telling. Angry Birds Dream Blast has a fun, polished gameplay which tries to iterate on a proven mechanic. It will most probably not be a smash hit anytime in the future, but with a few more months of development, it might be a moderate success for Rovio. If you have any comments or feedback, please do share it with me in the comments section below. Thank you for reading! Abhay Ramakrishnan is a Game Designer specializing in making and running games players play for months at a time with their friends. An iconic franchise’s core mechanics finally moulded for mobile. This deconstruct is an in-depth breakdown of all the game analytics, gameplay mechanics, systems design, monetization design and social systems in this game. I played Angry Birds Dream Blast for 8 days and shared my thoughts on the game! An in-depth deconstruct of Super Mario Run. It’s mechanics, monetization, metrics and UX.